I thought I would spend some time talking about the program I am heading into. Located within the Education department I will be working on getting my M.A. E.d. TESOL (Masters of Arts in Education with emphasis in TESOL. When I was picking which school to attend I mostly focused on the West in areas in California, so that I would be close to family. What I found was that most programs were situated in the English or Linguistics department and had a strong emphasis on the technical aspects of the degree. Of course, there is nothing wrong with this but as I looked at SU's program I began to see that it fit me better. 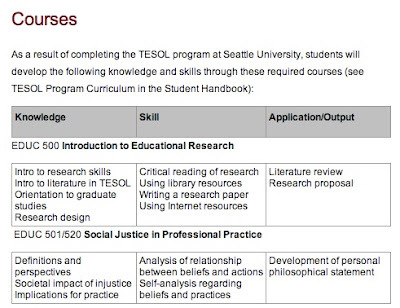 As I did the research I liked that the program prepares, "...teachers of ESOL who will be successful classroom teachers in a wide variety of institutional settings and cultural contexts." I was also impressed by the information available online and how organized it all was. 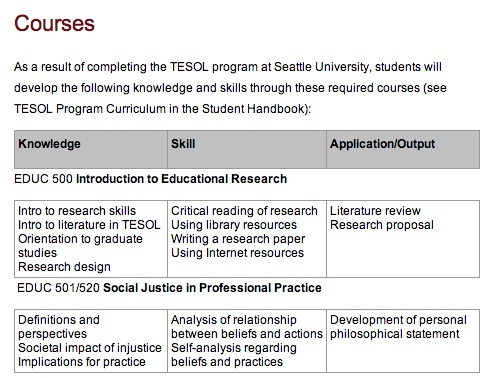 In the courses section, they didn't just list them but provided what kind of work will be expected from students. In addition to this I liked hearing that most classes were offered in the evenings, no more than 25 students per class and that they have internship opportunities. One catch was that they are on the quarter system, which I am not familiar with. So I will need to get use to doing my work faster than before and having shorter breaks. But the prospect of a new city and an enticing program are what finalized my decision to attend SU. Am I ready to be a graduate student? I'm not really sure what I could do to prepare myself to go back to school, other than take interest in articles and media related to my field of study. I'm definitely mentally preparing myself for the challenge and considering the hard work ahead. But mostly I'm excited to be a student again and to head back to the classroom where ideas and discussions will be fervent. I have found that by attending the Seoul KOTESOL workshops I enjoy learning and discussing about topics in TESOL. Also, I feel I have a lot to say and add to the conversation. Mostly, I'm looking forward to turning my five years of work in the field into something professional. Why not stay in Korea, keep your job and take an Online course? A few years ago I took an online TEFL certificate and worked really hard at it. I didn't have classes to meet up with online, but did most of it on my own time. However, that experience taught me that I missed the classroom. I'm not entirely sure how Online courses function, and from what I hear there are interactive sessions. But I really just couldn't see myself working full time hours then coming home to do my homework. I think I function better in the classroom then from a distance. Sure economically it makes sense to do your degree Online while keeping a salary at the same time. However, I do intend to find part-time, internships or volunteer work in the field to keep my teaching skills sharp.